Vitalreact Association is a group having Master Masafumi Yamasaki as the representative, who pursued the path of treatment and research with the late Dr. Pierce, an American therapist, for 20 years, carrying out his wishes currently and continuing the research of a number of new treatment techniques even today. 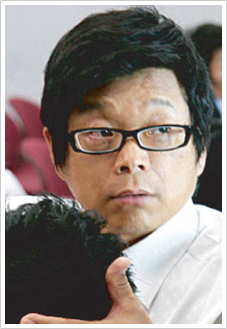 As to the activities, it is mainly about insisting on holding Results System Seminar. 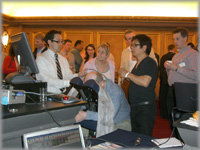 Designed and completed by Master Masafumi Yamasaki, it is a systematic medical treatment which makes full use of the most scientific examination and the latest medical equipment which are available as of now, as well as the further advanced adjustment techniques, to give better results more quickly for patients and for therapists. He attended a chiropractic seminar of Dr. Thomson and Dr. Ganstead held at Kyoto International Conference Center. For the first time, he met the real chiropractic treatment there and was moved, and started following the path of chiropractic treatment. He met Dr. Pearce for the first time, went to the U.S.A. in April of the following year, and worked as intern for 2 months at the Pearce Clinic. For over 20 years since then, he went to the U.S.A. more than 50 times, invited Dr. Pearce to his own treatment room and conducted the research together, and has become the only Japanese researcher of Computer Adjuster developed by Dr. Pearce. Even after Dr. Pierce passed away, as a leading expert of Pearce System, he proceeds with the research of Computer Adjuster, closely communicating with many foreign doctors, conducting the research in his own treatment room every day in order to establish an even better treatment system, treating many patients and achieving the “results”, for which he is appreciated. 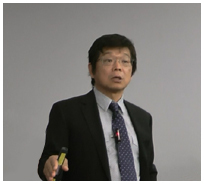 In recent years, he provides seminars worldwide such as the U.S.A., Europe, China and Taiwan. He is the only person (practitioner) who is qualified to teach and spread the techniques of Dr. Pierce. We, Vitalreact Association, (Chairman: Masafumi Yamasaki) is a group of therapists, mainly judo healing therapists and acupuncturists. It was started as Pierce Club in April in 1998, and more than approximately 200 practitioners in total have gathered from all over Japan presently aiming to provide world-class treatment. 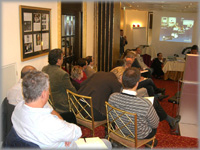 -Holding sectional meetings at each regional unit and study meetings for beginners. -Information exchange such as the actual situation of this business field at the national level. -Exchange with practitioners around the world, and transmission and presentation of information such as techniques. -Liability insurance for this treatment system.